Sling Shot, a pair of wheels with a fascinating design from the Suzuki inventory had succeeded in grabbing the sight of middle class commuters who travel in the busy city roads regularly. With minute changes in the looks and a small change in the body of the bike the second version of Sling Shot i.e. Sling Shot Plus has hit the streets. 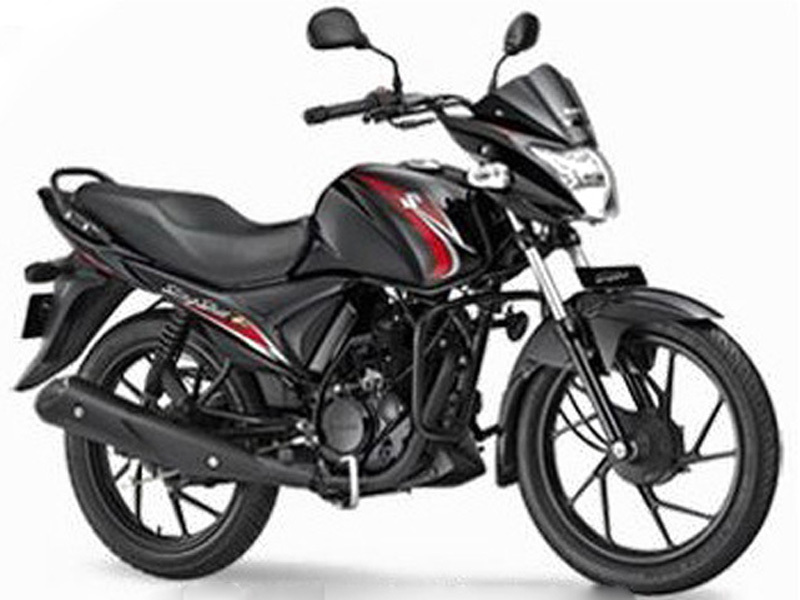 With features like designed alloy wheels in black, engine and silencer unit coated in black, light weight body and an engine designed to perform well in low and mid range speed with good mileage, Sling Shot Plus has positive signs in a competition to master the 125 cc segment of the market. A cover to the front of instrumentation unit just over the head lamp is an addition to Sling Shot Plus when compared to Sling Shot. The bike is available in both kick and self start types. The 124 cc single over head camshaft driven single cylinder engine uses fins to cool the cylinder by dissipating heat to air. A Capacitor Discharge Ignition System ignites the fuel air mixture. The engine is built to give high torque at low speeds. The bike would have quick pick up at lower gears and would touch the mid range speeds quickly. The maximum torque available from engine is 10 Nm. The maximum power output from this engine is 8.5 bhp which is not very high when compared to its competitors. The top end speed expected from this engine would not be very high. The engine uses Non-woven fabric to filter air in taken from the engine. Suzuki Sling Shot Plus has a tank which is designed in a fine manner with the graphics very much fitting the design of the tank. The lamp cover on the boat like fiber body at the rear goes well with the design of the body at rear. The indicators both at front and rear are separate from the head and tail lamp assembly. The seat provides enough space and comfort for the rider and the pillion. The whole body of Sling Shot Plus is made in a manner to suit the commuter's transportation need and keeping in mind the comfort. Suzuki Sling Shot Plus is driven by an engine that gives high torque at low and mid range speeds. The braking of this bike is effective with a disc brake which is actuated by hydraulic calipers in the front and a drum brake at rear. The telescopic and swing arm coil springs being damped by oil at front and rear give better handling ability and riding comfort especially in bumpy roads and in sharp turns. Each tyre is capable of functioning at 150 kg load levels including the weight of the bike. The top speed sustainability of the tyres is 150 km/hr and the bike is incapable of touching this speed. The bike has enough ground clearance to match the needs of curvy roads and potholed roads in India. 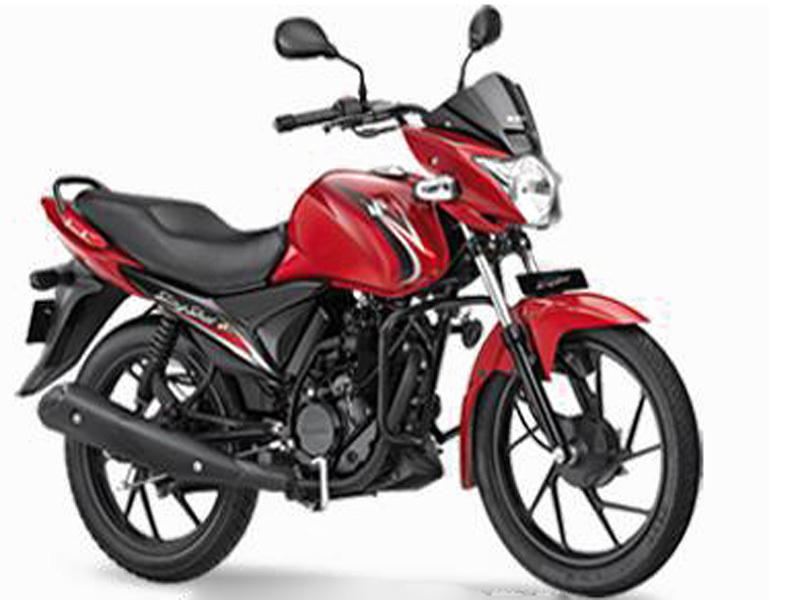 Suzuki Sling Shot Plus is made to give an economical ride to the Indian commuter. 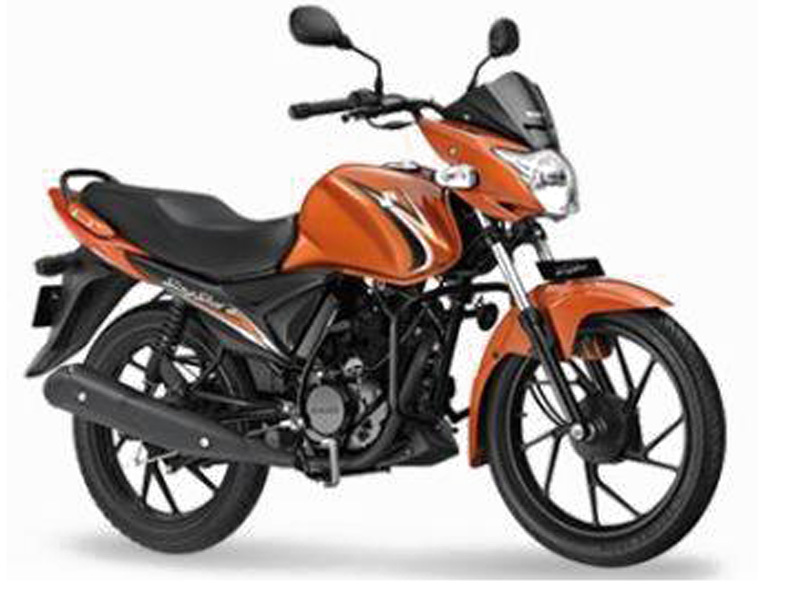 The bike is capable of travelling 60 km per litre of petrol under particular conditions of road and ride. Sling Shot Plus is available in three variants depending on two factors i.e. Presence of self start and presence of disc brake for front wheel. The bike is available in four colours namely metallic majestic gold, candy antares red, pearl nebular black and metallic fox orange. The price of Sling Shot Plus with disc brake and Self starter starts from 49,777 and goes up to 52,006.